I picked up the original edition of MonsterTime when it first came out in 1991. By that time, I was slowing wandering away from horror, so popular in the 1980s (for the ‘90s were upon us! ), but was intrigued by Dell Publishing’s new Abyss horror line. The back cover blurb also promised something more than the usual horror fair, and small town secrets. Curious, I picked it up from the shelf of my local bookstore. I’m glad I did. The novel delivered in spades. MonsterTime is a strong and delightfully eclectic novel of horror, time travel, dark fantasy, and historical fiction. With a pulp fiction meets literary writing style, the story is always energetic, sometimes scary, at other times funny, with enough forward momentum to keep the story moving, and enough twists to keep the reader guessing. MacRath has tightened the prose to great affect and tamed down some of the taboo subjects, at least as I remember them, but that’s not to say that you won’t find your share of controversial scenes in this book. They’re just handled now with a little more eloquence, by the deft hand of a writer who has 25 more years of skill under his belt. 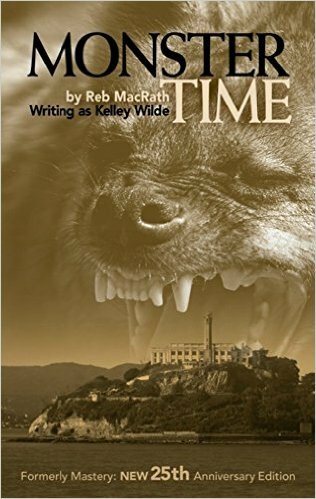 MacRath would later reexamine some of the themes and elements presented in this book in his more recent novels: trains, time travel, Alcatraz (The Rock), and martial arts, all appear and are important to the plot, along with the man on the run, and man out of time/without a country motif. His non-horror books Red Champagne and (his semi-autobiographical) The Vanishing Magic of Snow immediately come to mind. I believe MonsterTime is heavily autobiographical; no matter how far out some of the scenes might seem to be. I even noticed at least one possible revenge killing in this book. Yes—don’t anger an author. You will be killed off in his book in some horrible, horrible way! MonsterTime was ahead of its time when it came out, and I think it will remain so even now, and for many years to come. If you haven’t read it, you’re in for a treat, and if you have, it’s well worth the effort to read again. I can safely say you will read nothing quite like it in your lifetime. It’s an underrated masterpiece that’s impossible to pigeonhole, hard to put down, and not easily forgotten. This entry was posted in Uncategorized and tagged Amazon, Authors, Horror, Kelley Wilde, Kindlebooks, Mastery, Review on September 30, 2015 by David North-Martino.